How do your network operations measure up? “You can’t manage what you don’t measure”. This must be one of the most quoted management dictates of all time. Is it true? Well yes, up to a point. If you don’t measure your operational performance how can you identify ways to improve efficiency? And then show that the investment required to make efficiency improvements delivered a worthwhile monetary return? For many operators, asking the questions is straightforward: How productive and efficient are we? How good are our network quality Key Performance Indicators (KPIs)? The difficulty often comes in making accurate and meaningful measurements of operations and then understanding fully what they mean. It’s not like gauging the size of a room with a tape measure or standing on some scales to weigh yourself. The multi-faceted, constantly changing and highly complex nature of network and business operations is not as straightforward to measure. There’s another famous management saying: “There is no substitute for knowledge”. Attributed to the data scientist W. Edwards Deming, the point he was making was that even a little knowledge can save hours of work. Knowing how to measure operational performance and efficiency is something that Nokia Networks has built up over years of providing support for networks serving hundreds of millions of subscribers around the world. Our knowledge is based on the work of our many field and remote delivery teams, which has created a valuable intellectual asset. Tapping into this know-how is the basis for supporting operators who ask us to help them measure and improve their efficiency. In fact, the Nokia Operations Assessment Service is a consultative product created recently in response to several such operator requests from Asia and Europe. Operations efficiency benchmarking measures cost-effectiveness and productivity of network operations and the factors that drive efficiency. 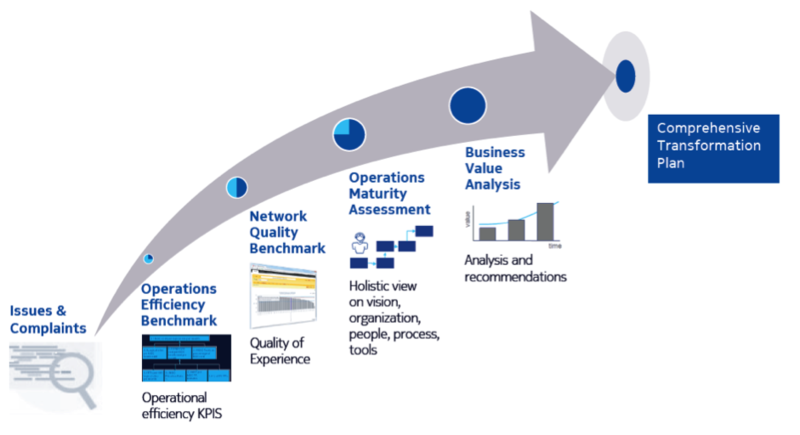 Network quality benchmarking assesses network quality as measured by Operational Support System KPIs. Operations maturity assessment complements the “hard”, quantitative benchmarks with “soft”, interactive analysis of the effectiveness of operations across five dimensions: strategy and vision, organization, people, processes, tools. Business Value Analysis creates a comprehensive transformation plan, along with its associated business case. The Nokia Operations Assessment Service combines a deep knowledge of what to measure and how to do it, backed by expert insight into the factors in an operator’s strategy, organization, processes, people and tools that need to be addressed to make worthwhile efficiency and quality improvements. In one project, for example, an operator saw a 9% cut in the resources it needed for reporting, and a 7% saving in resources used in resolving trouble tickets. Furthermore, the company now has a specific and actionable long-term transformation plan for operations evolution to achieve even greater improvements. You can take a deeper dive into the Nokia Operations Assessment Service in our recently published white paper: Operations Assessment: A Swiss Army Knife for improving network operations. Visit our webpages for more information on Consolidation Services and Managed Services. Please share your thoughts on this topic by replying below – and join the discussion with @nokianetworks on Twitter using #ExpertAdvantage #managed_services #NetworksPerform. Ashish is responsible for product development for operations assessment and managed security services. When he joined Nokia Networks, he thought it was cool that the Nokia office in Delhi was so close to his home. But since then, he's moved 5 times between Delhi, Bangalore and Singapore!